On Friday, Cherry Hill Police released a surveillance photo on their Facebook page of two suspects in an ongoing theft investigation. 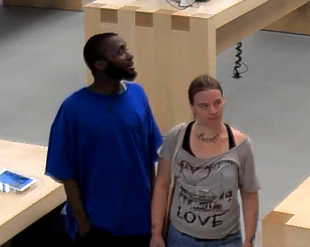 The alleged theft occurred at the Apple Store inside the Cherry Hill Mall. Police did not release any additional details about the investigation. Anyone with information on the suspects in the picture are asked to contact Det. Sorrentino at (856) 432–8825 or asorrentino@cherryhillpolice.com.